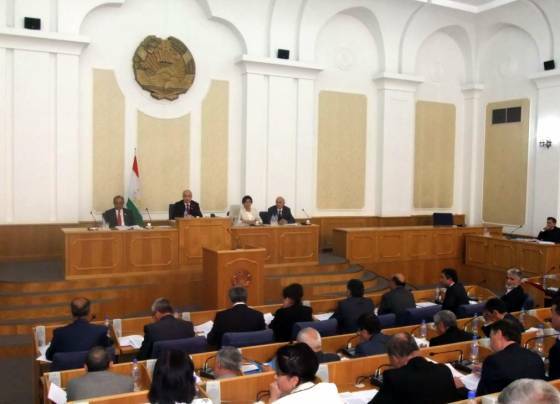 According to the Constitution of Republic of Tajikistan the highest legislative and representative body of the country is the Parliament of Republic of Tajikistan - Majlisi Oli, which consists of the upper chamber - Majlisi Milli and the lower chamber - Majlisi Namoyandagon. The members to Majlisi Milli are elected at a joint meeting of people's delegates of Dushanbe city and its districts, Gorno-Badakhshan Autonomous Region and its cities and districts, Khatlon Region and its towns and districts, Sogd Region and its cities and districts as well as Rayons (districts) of Republican Subordination and its cities and districts for the five year term. Committee on Coordination of Activities between Majlisi Milli, Majlisi Nazmoyandagon, Executive Bodies, Unions and Mass Media and International Relations. One fourth of the members of the Majlisi Milli is appointed by the President of the Republic of Tajikistan. A citizen above 35 years of age and with higher education can be elected and appointed as a member of the Majlisi Milli. Each former President of the Republic of Tajikistan is a member of the Majlisi Milli forever in case he doesn't refuse to exercise this right. The number of members of the Majlisi Milli and Majlisi Namoyandagon as well as the order of their election, non-election and incompatibility with a mandate of members of Majlisi Oli is determined by the Constitution.